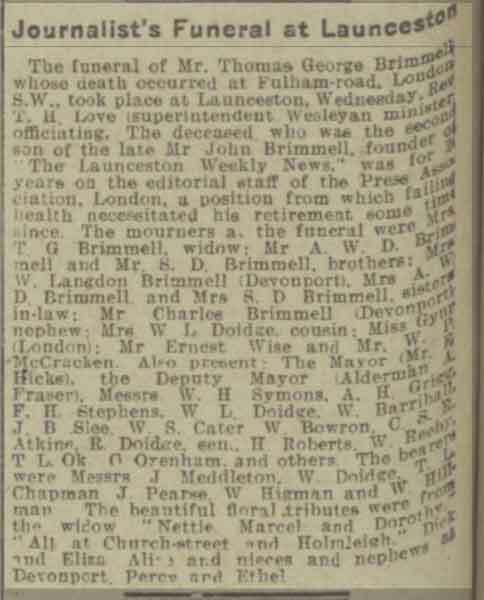 The bio of Thomas George Brimmell | Launceston Then! Thomas was born in 1856 to John and Ann Brimmell at 11, Church Street, Launceston. His father was a printer and newspaper proprietor, publishing the ‘Launceston Weekly News.’ He married Gertrude Mary Debnam on May 20th, 1884 at Camden, London and they had one daughter Gertrude. In 1897 they divorced after Gertrude had an affair with a Max Joynes. 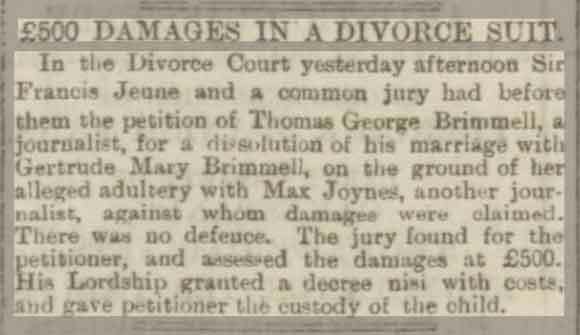 There then followed quite a public divorce which ended with damages of £500 and custody of the daughter being awarded to Thomas. He remarried in 1904 to Lillian Emma D’olson and together they had a daughter, Dorothy, with Thomas having adopted Lillian’s son Marcel. Thomas passed away after suffering from cancer on August 6th, 1915 at The Cancer Hospital, Fulham Road, London. In his will he left a total of £325 0s. 6d.